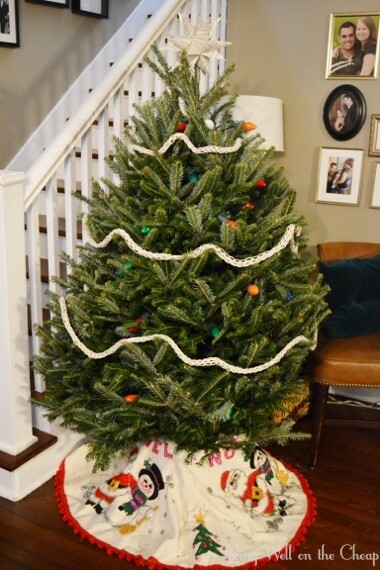 After my moravian star tree topper, the other crafty project I took on this weekend was a finger knit garland for our tree. The purple tinsel garland we already have has seen better days and I wanted to try something more neutral. I already had the supplies on hand so I figured there was no harm in trying, plus this was an easy one to work on while watching TV or even reading a book on my Kindle. I started with this cotton cord, which is actually the very last of a huge spool that’s been used in many, many small projects. 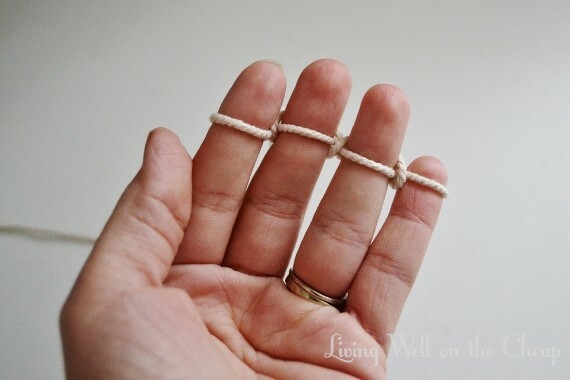 I highly recommend keeping some attractive string or twine like this on hand because it is just so useful. I even use it to wrap gifts! Anyway, I did actually end up having to go out for more cord before this project was complete, but I didn’t mind because I know I’ll use it. It was only about $3 with a coupon. 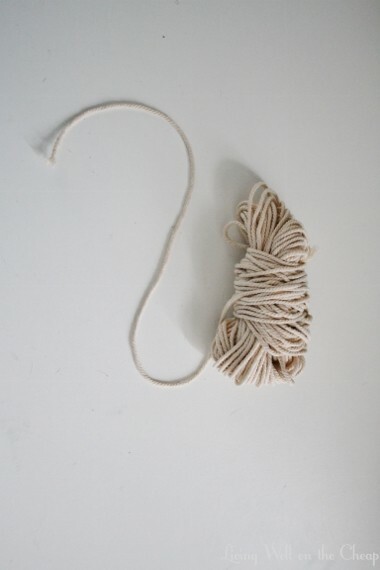 For the record, I originally tried to do this project with hemp twine because I had a huge spool of it but it was way too stiff and I gave up after only a couple rows. You could also use yarn, ribbon, strips of fabric, or whatever plentiful, pliable material you have on hand. I watched this youtube video to refresh my memory on how to finger knit. 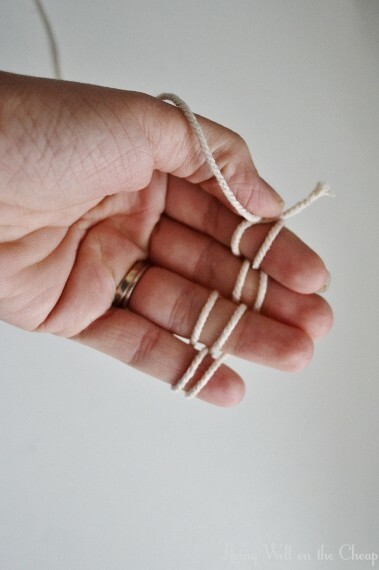 You just wrap the string around your fingers back and forth until you have two rows of loops. The video demonstrates it way better than I can–you can even get the gist without the sound on if you’re at work or hearing impaired. 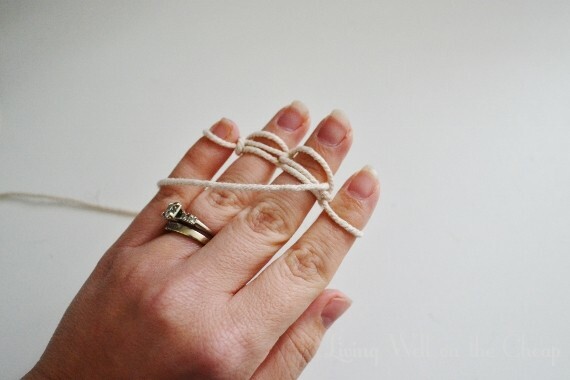 Then, starting with the pinky, I slipped each bottom loop over the one above it and let it slip behind my finger, leaving me with one row of loops. See, my first row of stitches on the back! After a few more rows it still doesn’t look like much, but just keep going and going and going. Make it as long as you want–you could make a bracelet, a necklace, or a long garland like I did. 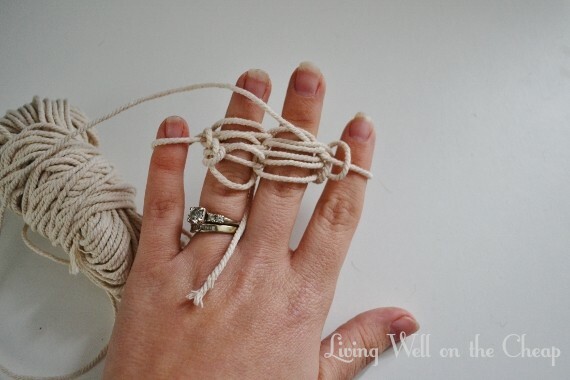 See the video I linked to above for instructions on how to bind it off at the end. 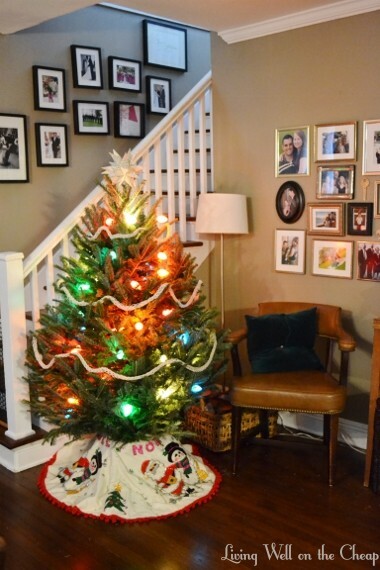 I really love the natural/neutral vibe it brings to the tree. I think it will look even better once I get some ornaments up there to fill things in a little! 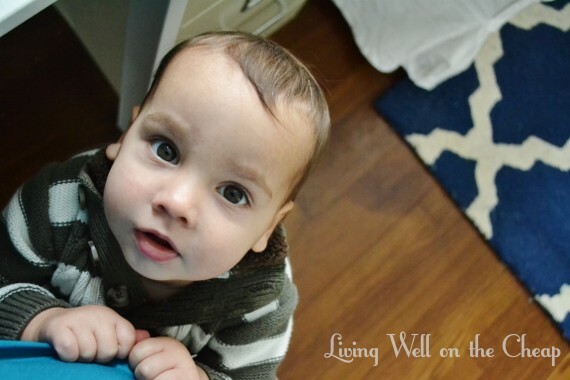 And just for kicks, here’s a picture of Jack clinging to me while I knitted the first few rows standing at my desk. He’d been playing happily only moments before, but as soon as he saw I was up to something he was all over me like white on rice. You parents of littles know what I’m talking about.